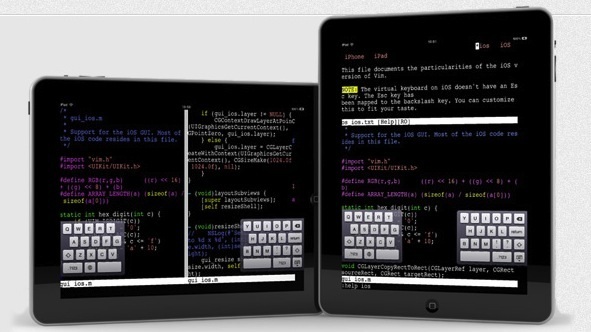 The powerful Vim text editor is a longstanding favorite amongst developers and sysadmins, and now it has been ported over to the iPad and iPhone. The version for iOS is full featured, including automatic indentation, visual mode, language-aware syntax highlighting, integrated scripting capabilities, macro recording and playback, place markers, multiple clipboards, and much more. If you already use Vim, you’re well aware of the advantages, if you haven’t used Vim or you never bothered to learn it’s intricacies, it can seem confusing and rather foreign. I’ve never been a huge fan of VI or Vim myself, but for those who like the text editor this should be a great app to add to their iOS repertoire. Due to the difficulty of touch typing at any length, it’s recommended to use a Bluetooth keyboard with the iPad or iPhone if you plan on using the Vim for anything lengthy. How am I supposed to get files in there for Vim to edit? Through iTunes sync only? just jailbreak the iBrick dammit!